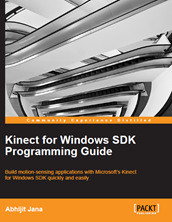 Here is the list of 14 cool Kinect for Windows SDK Tips and Tricks that you found very useful. Couple of months back I published a post to share the list of Kinect for Windows SDK tips and tricks that I was writing at Daily .NET tips. In the past few days; I have also shared another set of tips that are mainly related with the Kinect Speech Recognition. That’s all as of now. I will keep coming…. Thanks for reading..